And that’s how I feel, now: privileged. 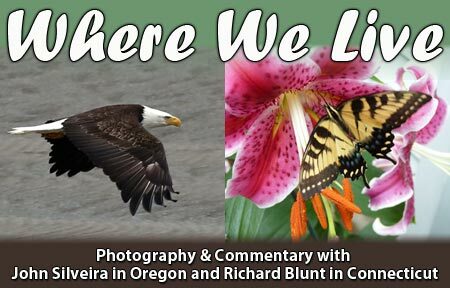 I’ve never lived anywhere where I can step outside and see deer grazing fifty feet from my front door, or watch ospreys pulling fish out of a river, or see eagles soaring overhead. 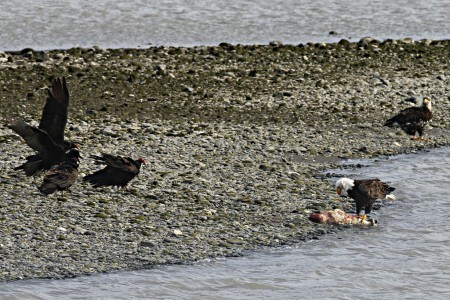 Several weeks ago, my friend, Earl Yager, called me to say there was an eagle at the Port of Gold Beach and it was feeding on something. I was there within minutes. As I recall, I was still wearing my slippers. 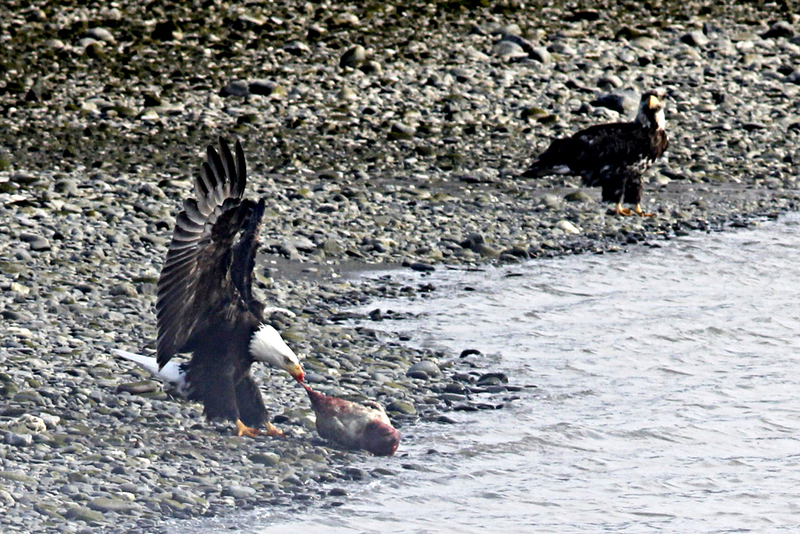 But Earl was wrong; there were three eagles at the Port, an adult and two juveniles. What they were feeding on was a dead seal. These photos were shot with my old Canon 60D using my EF 400mm f/5.6L USM lens. All are crops and I processed the first four to make them sharper. 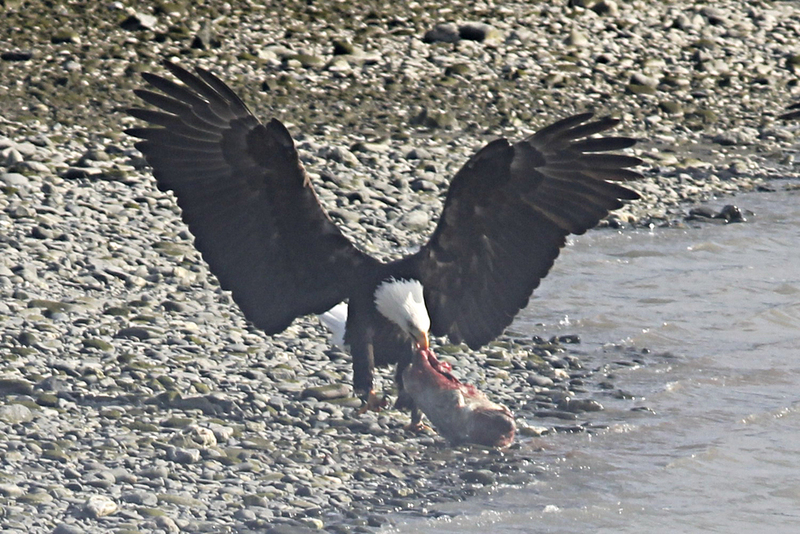 When I arrived, the adult bald eagle was feeding on the carcass of a seal. One of the two juvenile eagles patiently waited, nearby. 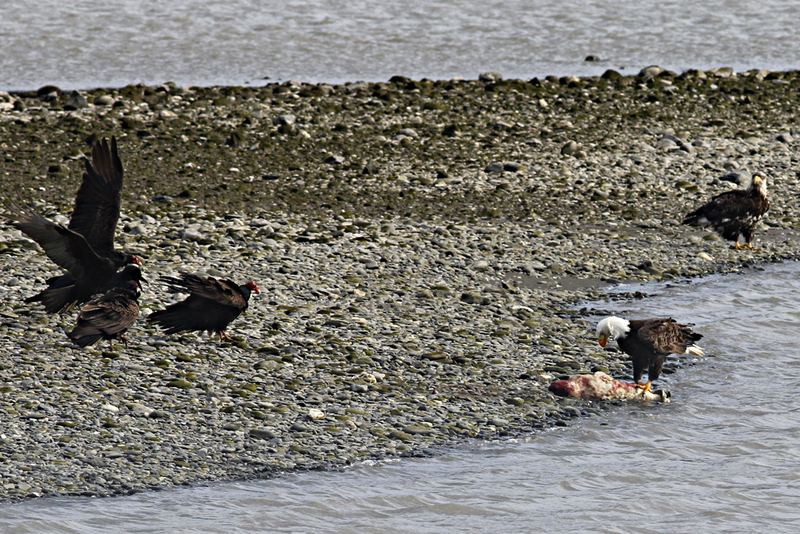 Pretty soon, turkey vultures, ravens, and seagulls joined the juvenile eagles. Though some inched closer, none dared tangle with the eagle while it ate. 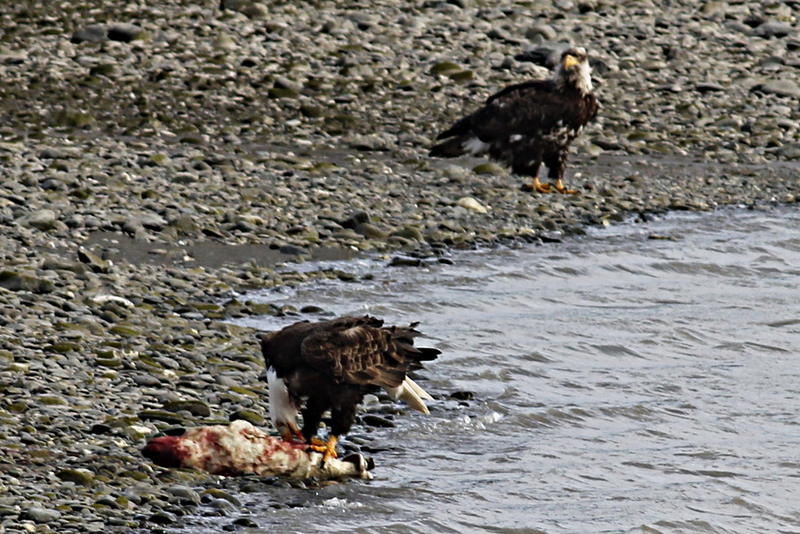 I watched and took photos for almost an hour while the tide inexorably rose, submerging more and more of the carcass. 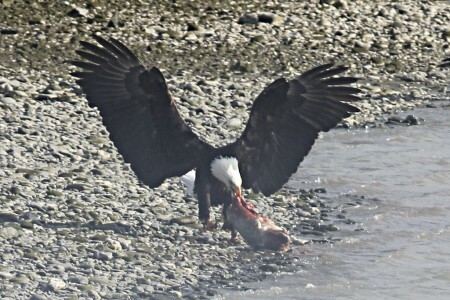 Suddenly, the eagle braced itself on the gravel bar and, using its powerful legs and the beat of its wings, it dragged more of the seal out of the water. 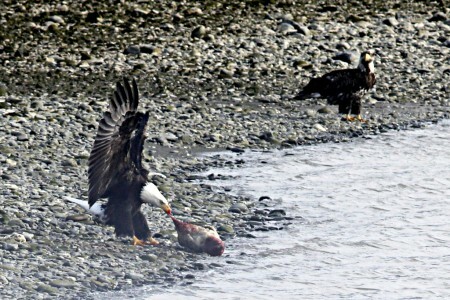 Though the eagle weighed a dozen pounds at most, it was able able to drag a body that weighed much more. I moved to a new position, for better photos, and when the adult had had its feed, it flew further down the beach and this juvenile moved in. As the tide rose, the young bird, tried to pull the carcass out of the water, but it wasn't strong enough and, eventually, the tide overtook it and the remains of the seal's body were submerged. When I returned at low tide, the carcass was gone. 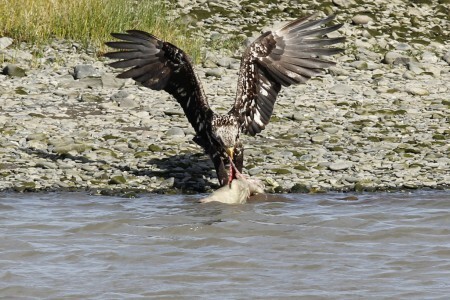 This entry was posted on Tuesday, May 8th, 2012 at 12:01 pm	and is filed under Bald eagles. You can follow any responses to this entry through the RSS 2.0 feed. Both comments and pings are currently closed. This definitely tells a story. The commentary is just supplemental as I feel the photos say it perfectly well on their own, Good choice for a captivating entry. You have me hooked! When I was stationed on Adak in the Aleutians, every summer we would have 100s of eagles show up, and stay until the weather changed in the fall. There were so many that after the first couple had arrived for the summer season they were pretty much ho-hum. I worked in Kodiak for a couple winters and the eagles would set on the flat rook of the building I worked in. Sometimes a dozen would be there. I live close to the Mississippi river now and see them all the time. Some of God’s best work.